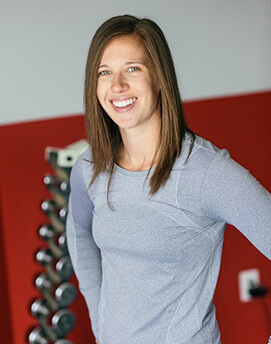 Abby Johnson is a Certified Strength & Conditioning Specialist. She has a degree in Exercise Science with a minor in coaching from the University of Northern Iowa. She completed an internship with a Nike Sparq certified gym, Athletic Evolution, in Boston, MA, where she trained both middle and high school athletes in strength, conditioning and olympic lifting. 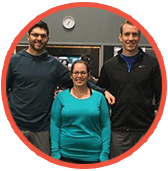 Abby is a certified member of Functional Movement Systems (FMS). She has a diverse background in playing and coaching volleyball, basketball, and softball. She played volleyball at the collegiate level and continues to coach volleyball and instruct private lessons. Abby has a passion for training individuals who love an intense workout and loves to push people to their max. For her, it’s about helping individuals reach their fitness goals, whether building muscle, losing weight, moving better, or simply attaining a healthier lifestyle. She pushes her clients to reach their highest potential by developing challenging, innovative programs while encouraging long term, manageable lifestyle habits outside of the gym.